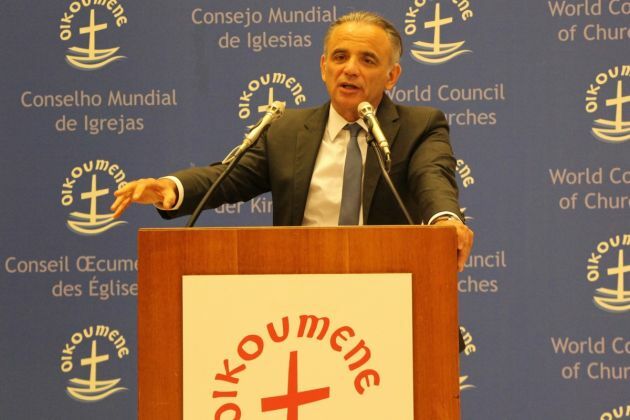 (Photo: Ecumenical News / Peter Kenny)Dr. Luiz Loures, deputy executive director of UNAIDS speaking at the Ecumenical Centre in Geneva, Switzerland on May 21, 2015. GENEVA - Global health and religious leaders meeting in Geneva's Ecumenical Centre have noted the essential role Faith Based Organizations play in providing global health services and notably in developing nations. But FBOs have also been told they should be less modest about their work and build communications on it. They met at the World Council of Churches in Geneva on May 21 at a meeting entitled, "The future of faith-based health care provision", where they related some of their experiences to the global Ebola crisis. Dr. Luiz Loures, deputy executive director of UNAIDS, said the Ebola crisis was "more than a wake-up call" and it along with a meeting such as at the WCC's was helping in where "this transition takes us" in medical services provision. "Faith-based workers were the first ones to die of Ebola, but before they were also the first ones to care about it," said Loures. He urged FBOs not to be too modest about their work, "Look to the evidence. The evidence speaks for itself. "You can build your communication. When you build your communication you have evidence," which can help in building knowledge of work of religious institutions in the field of medical care provision. The meeting at the WCC took place as the World Health Assembly was taking was being held in Geneva from May 18-26. "For us as Christians or faith in God as creator, God as our reconciler, God as our healer, and also the God who calls us to serve," is important said WCC General Secretary, Rev. Olav Fykse Tveit, in opening remarks. He said he once had a conversation with a leader from the United Nations refugee agency (UNHCR) speaking about migrants. He told Tveit, "We are stupid at UN organizations if we don't work with you because if we really want to find someone who wants to deal with issues of migration and refugees we will find then in your circles." The same applies to health services said the WCC general secretary. Zimbabwe's Minister of Health David Parirenyatwa attended with his significance due to his country currently holding the chair of the African Union. Also attending, along with international health experts, was a group of students from the department of nursing and public health at Kent State University from Ohio in the United States. They heard how FBOs play a key role in global health, especially in developing nations. "Every year more than 20 students attend the World Health Assembly (WHA) in Geneva and also visit the WCC through its health and healing programme as part of their studies," said Ken Slenkovich of Kent State University in Ohio. As assistant dean at Kent State University's Center for Public Policy and Health, Slenkovich said their visits to the WHA began five years ago. During the visits, students and faculty learn about international organizations and are exposed to "an international pathway" in the world of health. Kent State University is a key provider of health care professionals in the state of Ohio and beyond. The WHA brings global health policy makers and leaders, as well as representatives of non-governmental organizations, to Geneva each year. Students learned for instance that in Zimbabwe FBOs cover 68 percent of health care delivery in rural areas. FBOs are the second largest health providers in that nation, second only to the ministry of health and child care in Zimbabwe. "We are a secular public university but see a value in having a relationship with faith-based organizations as they are essential in the world health system, as we have seen today," said Slenkovich. Those working in health, health leaders and faith leaders who met at the WCC shared experiences, bringing evidence about coverage, quality of care and responses to epidemics, emergencies and conflicts. Dr. Samuel Mwenda, General Secretary of the Christian Health Association of Kenya, who also co-chaired the meeting said FBOs in his country's health sector were very important, but not achieving their full potential. "FBOs have lost many lower level health facilities which have closed down due to lack of funding," he said raising the question, why? He cited a loss of donor subsidies, no Government funding, poor communities served who have no or limited means of paying for medical services and the increased cost of health service delivery inputs among others. "This represents lost opportunity for communities previously served by these health facilities," he said. Monsignor Robert J. Vitillo, who heads works for Caritas Internationalis as both head of delegation to the United Nations in Geneva and special advisor on HIV/AIDS and health, shared a similar view to Mwenda. He noted how FBOs are in the communities before a crisis such as that around Ebola. They will there after international NGOs leave and special help from different governments has gone, with a commitment extending far beyond the crisis. "We need access to funding and resources in accord with the burden of care we shoulder. We are there; we are partners; we are not competing with the government," Vitillo said in a plea to the international community. "We are complimenting what governments cannot do. We should not be seen as a threat. We should not be seen as duplicative. "The inter-governmental organizations need to learn that there are more than government in this world that are delivering health services to people. "When the only basis for help and support is based on government to government support we really are losing the help that we can offer to many, many people who are never responded to by the government," he said. Vitillo noted that many of the FBO services are "alone in those countries in conflict where those governments don't have control over some of the areas where we are and we are delivering services." 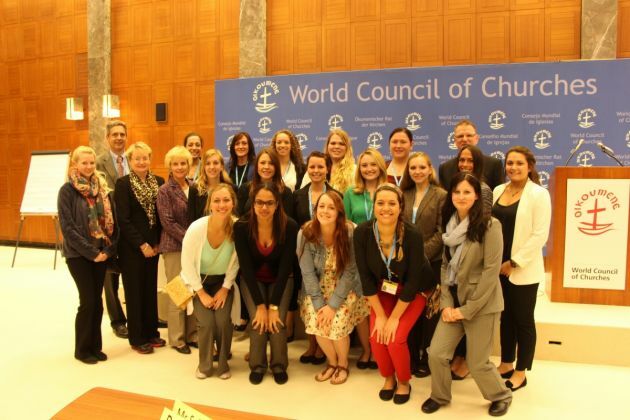 (Photo: Ecumenical News / Peter)Nursing and public health students from Kent State University in Ohio attending a meeting on "The future of faith-based health care provision" held at the World Council of Churches in Geneva on May 21, 2015.